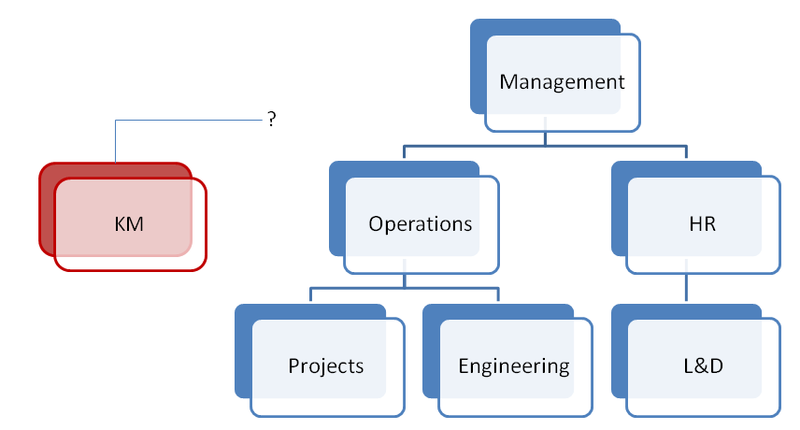 Implementing Knowledge Management is a long project of culture change, and the introduction of a new management framework (roles, processes, technologies, governance). The Knowledge Management team’s initial role is to design and introduce the framework, delivering the required changes in behaviour and culture. 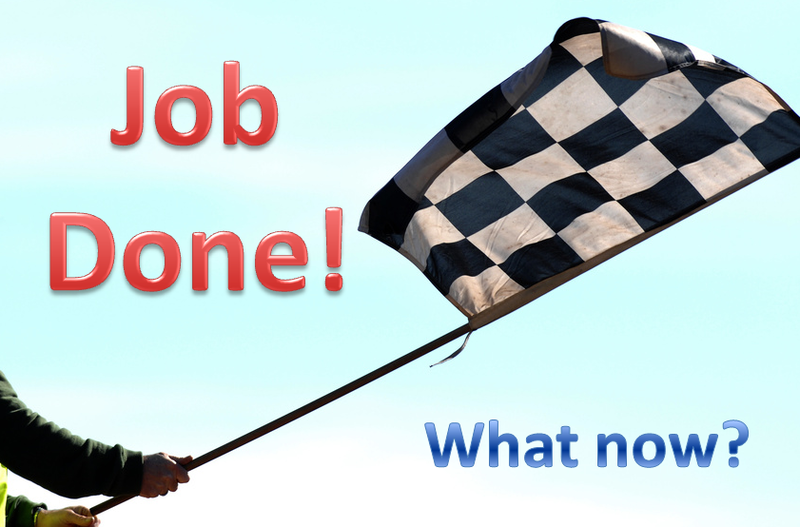 Once that job is done, what role does the KM team have? Some people say that once this job is done and Knowledge Management is fully embedded into the business, you can disband the team, but that isn’t the case. Once Safety Management is embedded do you disband the Safety team? Once Quality Management is embedded, do you disband the Quality team? No; you retain them, because they still have a key role to play and without them playing that role, Quality performance or Safety performance would revert to pre-change levels. The same would happen to KM. Here are 10 key elements of that continuing role for the KM team. They need to support usage of the framework. This includes training people in its use, coaching the KM professionals, running the KM CoP, launching other CoPs, building the knowledge asset about Knowledge Management. They need to monitor and report on the application of the framework. This includes checking compliance with the KM policy and expectations, measuring the application of lesson learning, tracking value added through communities , auditing the management level of key knowledge assets, measuring the maturity of key CoPs, collecting results of any KM Dashboards or scorecards. Then reporting a summary of these metrics to senior management. They need to coordinate any KM recognition activity. This includes running annual awards schemes, for example, or finding other ways to recognise the star performers, as well as finding ways to deal with the people who refuse to engage with KM. They need to continue to keep the profile of Km high, through communications campaigns or KM focus weeks. They may take on specialist roles themselves, such as lessons management, or major lessons capture, development of KM plans for major projects, and big Retention exercises. The KM team will act as client for any outsourced KM services. The KM team has a job of work still to do – to manage, maintain and continuously improve the KM Framework – and these 10 tasks form the core of their work. Here are ten things a KM Champion needs to understand in order to do their job well. Find out what management need from KM, what you need from them, and the value proposition for management. Also find out what the knowledge workers need from KM, what you need from them, and what their value proposition is. What is in scope, and what is out of scope? Find out the critical knowledge for your part of the business, so you can focus only on the most valuable knowledge – the 20% of knowledge that will make 80% of the difference. Is it new knowledge, where the focus is on rapid learning? Is it knowledge spread among many people, where the focus is on sharing good practice? Is it old knowledge which should be standardised? Is it knowledge of an expert, which should be captured? This is the framework of roles, processes, technology and governance that defines how knowledge will be managed in your organisation. You need to make sure you understand this completely, as this is what you will be trying to implement in your own project, department or division. Knowledge synthesis tools and processes, such as Knowledge asset creation and update, knowledge article creation and update, wikis and knowledge bases,. Knowledge access and re-use tools and processes such as KM planning, and the use of search tools and people-finders. Knowledge creation tools and processes, such as Deep Dive. If communities of practice are included in your KM Framework then you need to understand how these work, and the roles, processes and technologies involved. Understand the barriers to KM and how to overcome them, and the enablers you can use. Understand the use of pilot projects and “proof of concept” activity. Understand the influencing techniques you can use, and the use of social proof, in selling the concept of KM internally. This includes the elements of KM expectation, metrics and rewards, and support. Governance is the issue that will be most powerful in reinforcing KM behaviours, and you need to be able to explain your stakeholders how it works. Contact Knoco for help in developing your understanding further. To which department should KM report? Where is the best place for Knowledge Management in an organisation? This is a common question in the early stages of a Knowledge Management implementation program. It also sometimes arises later on; if you start KM with a temporary task force reporting at a high level, then when KM becomes operational you need to find an organisational home for the ongoing support team. Science Group; volunteers and strategy; Fire & Incident Management ; Finance; Planning and evaluation ; Innovation and academic development; Standards and studies; Dirección de Estudios; Knowledge and Information Services; Education Research; Business Systems; Strategy, innovation and risk management; Policy analysis & Research; Corporate Services; Naac; Management Development Department; Quality and Operation department; HR and Engineering dept/division; Client Experience; Supply Chain; Customer Support;Corporate; Health and Wellbeing Division; Central Services – Information Management; Customer operations director; Corporate Services; I answer to the Service Line Leader; Future Business; Monitoring, Evaluation, Accountability and Learning; Corporate University; Distributed model – embedded within organizations; Sport Science and Medicine Director; Education and quality; HSE…. ; Consumer Market Insights and Business Intelligence teams ; Directly to the Portfolio Management, KM and strategic projects team; Services; Information Technology + Business transformation program. So based on common practice, KM can report anywhere, and it probably should report in the place where it makes most sense – where the knowledge issues will deliver the largest value, where the business demand is greatest, and where you have the most powerful advocacy. However here are some things to look out for in the various scenarios shown below. Reporting separately to senior management is ideal in the early stages, but KM support will eventually need to be embedded somewhere, in a part of the organisation you know is going to survive in the long term. Being a separate item makes you vulnerable, even though it may give you high level access. Reporting to strategy is an excellent option, as it keeps KM strategic. Maybe some of the tactical issues of KM might suffer, but I would rather lose the tactical aspects than the strategic aspects. Reporting to operations is a good option (or to Projects, in the case of a project-based organisation), as it avoids KM being seen as a support function, and keeps KM grounded in the operational needs of the firm. However remember the four legs on the KM table – People, Process, Technology and Governance? An operational focus may emphasise process over People and technology. You will need to interface closely with HR and IT. Reporting to IT is possible, but you have to take EXTREME care that KM does not become seen as a technology exercise, and that people, process and governance are equally well developed. You will need to interface closely with HR and Operations. Reporting to HR or L&D is possible, but you have to take EXTREME care that KM does not become seen as a people issue, or another branch of training. Make sure that the technology, process and governance sides receive equal attention. You will need to interface closely with IT and Operations. KM can report almost anywhere, depending on operational need. However make sure that no matter where it reports, equal attention is paid to the four main enablers of KM, to ensure a complete and balanced approach. 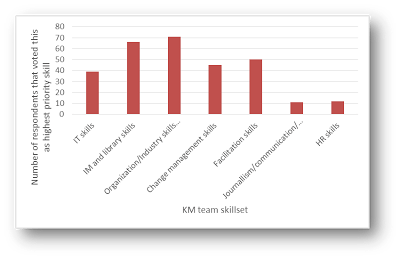 There are many skills needed on your KM team, but one is more important than any of the others. I have been involved in a few overview visits to Knowledge Management programs recently, and a common factor in all of them has been a missing skill within the Knowledge Management teams themselves. One team, reporting to the HR function, was staffed with people with HR backgrounds, and as a result was focusing on KM as it relates to succession planning and staff development. Another, reporting to the research department, was staffed by researchers and analysts. All were understaffed, and all lacked members with an operational background. It is those operational skills that are most important in a KM team. There is point in having all the HR skills, all the IT skills or all the IM or facilitation or change management skills, if you cannot translate your Knowledge Management message into the operational context of the organisation, and if you have no credibility with the operational staff. Our 2014 survey of Knowledge Management showed “Operational Skills” as the highest ranked KM team skill (see the graph above). 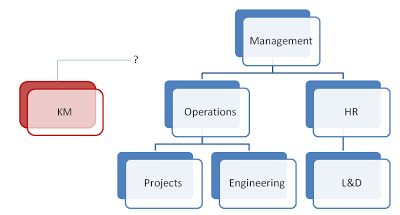 The role of these staff on the team is to ensure that the realities of day to day work are brought into the Knowledge Management program, that the language of KM is translated into the language of operations, and that the Knowledge Management Framework will ultimately add value to the knowledge workers. Who do you need on the KM team? Here are 4 key skill areas you must not ignore when putting together your Knowledge Management implementation team. You know the four enablers of People, Process, Technology and Governance? What we call the four legs on the KM table? These four areas should be reflected in the people and skills you choose to drive Knowledge Management implementation. If the aim of the KM team is to introduce new behaviours and practices to the organisation, they will need people skilled in training, coaching and mentoring. Look for people with skills as change agents and business coaches. One or more people with a training background should be on the task force. The knowledge management implementation task force has a hard job ahead of them, changing the culture of the organisation. They will be working very closely with people, often sceptical people, and they need very good influencing and facilitation skills. Secure facilitation training for the task force members. The early stages of implementing knowledge management are all about raising awareness, and “selling” the idea. The KM team needs at least one person who is skilled at presenting, communicating and marketing. This person will also be kept busy raising the profile of the company’s KM and Best Practice activities at external conferences. The team need experience and skills in the operational processes of the business. The KM team should contain people with good and credible backgrounds and skills in each major organisational subdivision. This is really to establish as much credibility as possible. When members of the task force are working with business projects, they want to be seen as “part of the business”, not “specialists from head office who know nothing about this sector of the business”. They have to be able to “talk the language” of the business – they need to be able to communicate in technical language and business language. They act as Best Practice champions within their area of business, and when the working task force is over, may take a leading Knowledge Management role in their subsidiary. The KM team needs at least one person who has strengths in the details of the current in-house technology, understands the potential of new technology as an enabler for knowledge management, and can help define the most appropriate technologies to introduce to the organisation. Finally the Km team needs a person who can look at KM from a high level – who can understand how it fits into the governance systems of the organisation, and twho can work at a high level to introduce the policy changes and the governance systems that are vital to the long term survival of KM. This person can be the KM team leder, or even the executive sponsor. If the KM Table has 4 legs, then make sure there are people on the team with enough skills to look after each leg, to make sure your final framework is sturdy and sound.